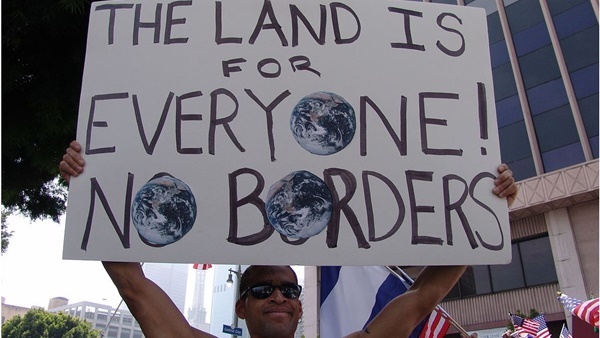 You are here: Home / Blogs / Peace & Violence / What About Open Borders? There are things that go unquestioned in the national discussion. Because this is a country wrapped in fear and self-importance, the basic, unchallenged premise determining how we behave, how we spend our money, is that we need to protect ourselves … from The Enemy. This was in 2006, as Greg Grandin points out at TomDispatch, in his “timeline of border fortification.” That was just one step in our national journey toward utter border paranoia. We need drones and helicopters, blimps and surveillance balloons, not to mention razor wire, to protect ourselves from … poor, desperate people fleeing war and poverty on foot, often with their children? They are our enemy? As Gary Younge, writing last fall in The Guardian, confessed: “… borders have always been a tense issue for me. With those in uniform struggling to match the colour of my face to the crest on my passport, how could it be otherwise? To be black and on the move in the West is to be an object of suspicion. The documents are supposed to speak for themselves; but somehow there was always more explaining to do. And these personal objections are intimately connected to a more sweeping philosophical and political opposition. Image: “May Day Immigration March LA37″ via Wikimedia Commons. Available via Creative Commons Attribution 2.5 Generic license.